The navigation is easier to understand from the screenshots below. 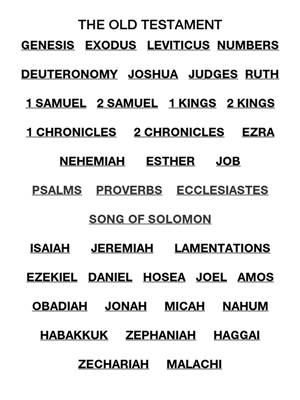 The Table of Contents is in a grid format as apposed to a single list, with all of the Old Testament books on the first page and all of the New Testament books on the second. There are two versions, one for Amazon devices and one for Mobile Phones, however both Bibles will work with all Amazon devices and the Kindle App. The two Bibles are identical with the exception of the Kindle Mobile version having a slightly more narrow Table of Contents to accommodate a smaller screen. For reference, the Table of Contents grid of the Kindle Fire edition will fit on a standard kindle up to font size 6, whereas the Table of Contents of the Kindle Mobile version will fit up to font size 7 on a standard kindle. The screenshot on the left shows the Table of Contents in Grid Format with all the Old Testament books on one page. 1-The Chapter Links at the beginning of every book. 2-The 4 Chapter Header Shortcuts. 3-JumpToVerse-A link for every tenth verse. 4-The TOC Links in every verse. There are 4 Shortcut Links at the beginning of every chapter. OT and NT are for the Old Testament and New Testament - Table of Contents. RP is for the One Year Reading Plan. The Reading Plan is at the end of the Bible with direct links for each daily reading. CH is a link to the Chapter List for the book that is currently open. 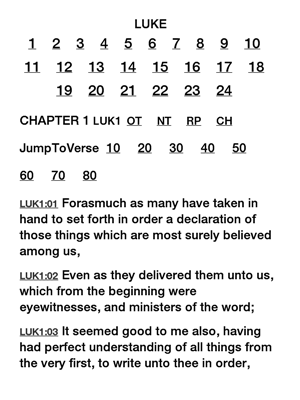 JumpToVerse are links for every tenth verse in the chapter, this is efficient and simple to use. A link for every verse was too cluttered. TOC Link in every verse - Return to the Table of Contents (TOC) by tapping the verse reference at the beginning of any verse. The verse reference not only serves as a link to the TOC, but also keeps the reader informed of their location within the text at all times. For anyone who would like to help out with our ministry, please considered purchasing any of our eBooks, or leaving a review. All Book Royalties are for the ministry of Jesus Christ. Thank You.